Drop-in Babysitting & The ZONE | Simon Family JCC | Fitness. Family. Fun. For Everyone! The Simon Family JCC strives to help our members get the most out of their experience here! We are happy to provide drop-in childcare to members for children ages 6 weeks through 12 years of age. While you work out, children ages 6 weeks through 5 years will have fun in the Babysitting Playroom reading, coloring, or climbing in our indoor playground. Your child will be under the supervision of loving and caring staff with over 30 years of combined childcare experience. Our little ones can enjoy a nap, bounce in our bouncy seats or relax in loving arms. FREE with membership/2 hour limit per day. Space available based on standard Child Care required ratios. Do not have to register; parents MUST stay on JCC side. 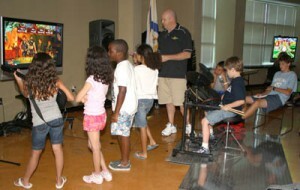 Children ages 6 through 12 years will have a blast in The Zone. Your child will enjoy a kid-friendly room filled with toys, puzzles and games that includes life sized checkers and chess pieces. We even have computers with filtered internet content for your gamers! Kids Night Out, the 3rd Saturday of each month, is a special program just for JCC members. Children ages 6 weeks through 12 years are invited to join us for an evening of crafts, games, snacks and lots of fun. For our friends 4 years old and up, we go swimming! Parents enjoy a night out while dedicated and experienced staff provides a safe, supervised and fun night out. Due to staffing requirements, pre- registration is required. Drop-offs may not be accommodated on the day of the event. Where: We begin in the JCC lobby for sign in and then dismiss to begin the fun! Kid Fit is a complimentary service for our younger members aged 6-12 years. Fun fitness activities take part all over the campus so parents should check at the front desk as to the day’s specific location.